First, diabetes is not like a cold or an infectious disease. It is not passed from one person to the next in the air or by contact. Let me make an analogy that I am sure you would agree with. If a couple lives together and one of them develops cancer, it does not mean that the other is also going to get cancer just because they eat the same food. The food they eat may or may not have something to do with origin of the cancer, but there are other more important determining factors to consider. At the root of diabetes, like cancer, is genetics. Two people living together who are unrelated-by-blood have very different genes. Despite eating the same foods, it’s their genes that play a larger role in causing a metabolic- or lifestyle-related disease or not. However, let me state immediately that the genetic cause of Type 2 diabetes is not what you may think it is. 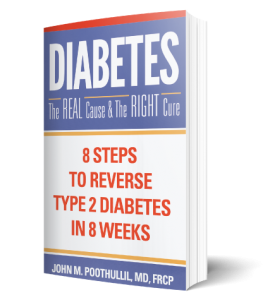 Unlike many adult cancers, which have been definitively proven to be caused by a mutated gene, no mutated gene has ever been found to directly cause Type 2 diabetes. In fact, given how much genetic research has been done, it is strange that research has not been able to identify a genetic causation to “insulin resistance,” which is commonly said to cause high blood sugar. So what might be the genetic element in Type 2 diabetes that helps us understand why two spouses or partners who eat the same foods will not necessarily both develop diabetes, even if one is diagnosed? After 20 years of research, I suggest that the genetic element in T2D has to do with the how your genes determine your body type, especially your fat storage capacity. Each person is different in their inheritance of every element in their body—bone structure, muscle mass, and fat storage. What does fat storage have to do with diabetes? In my view, the amount of fat your body can store is a critical factor in whether or not you might develop diabetes. Your fat storage capacity is critical because in our modern diets, most people are consuming as much as 50% of their food energy in the form of complex carbohydrates, especially grains and grain-flour products. These carbs break down during digestion into large numbers of glucose molecules. The liver can store 120 grams of glucose at a time, and it releases the remainder of glucose into your bloodstream for your body’s cells to burn and convert to ATP, which powers cellular functions. However, whatever glucose your cells don’t consume within hours of eating is converted in the liver into triglycerides, also known as fat, which are sent to be stored in your fat cells. Here’s where your fat storage capacity comes into play. If you have filled your fat cells over time, and they are completely full, there is nowhere for those triglycerides to be stored. However, in preparation for storage, the triglycerides were further broken down into fatty acids, which flood your bloodstream and are now used by muscle cells as their fuel to produce ATP rather than glucose. The burning of fatty acids by muscle cells is a normal body metabolism that occurs when your body has run out of glucose between meals or if you are exercising heavily. But now, with your fat cells full, your blood has high levels of triglycerides and fatty acids, so for muscles the “fatty acid burn switch” becomes a constant condition. The result: any glucose released from the liver is not needed by muscles, and remains in the bloodstream, thus high blood sugar. So, as this explanation shows, your genes determine your fat storage capacity which then plays a role in potentially triggering the fatty acid burn switch if your diet is high in carbohydrates and, little by little you fill your fat cells to capacity. 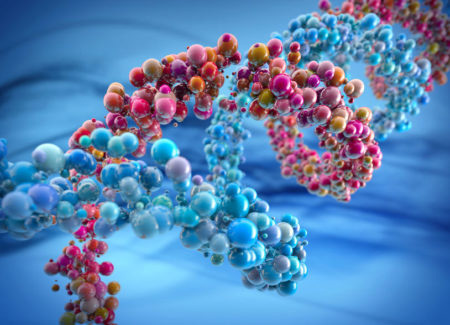 This explanation helps understand why some ethnic groups are more prone to diabetes than others – their genetic inheritance reflects generations of genes that determine a tendency for less fat storage than other ethnic groups. This explanation also helps explain why some, but not all obese people become diabetic. In some obese people, they have filled up their fat storage, but in others, they still have more capacity to store fat. 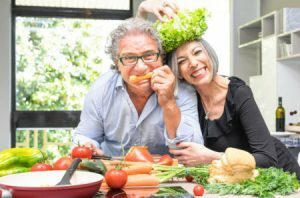 So, as you can see, spouses or partners living together are not susceptible to diabetes by virtue of living with each other or eating the same foods. Their predisposition to diabetes has first to do with their genetic inheritance. Their diet may play a significant role in both people developing diabetes if they both tend to eat high carbohydrate diets full of grains and grain-flour products, but the susceptibility must come from their genetic makeup. PreviousPrevious post:Is There Any Value in Reading Nutritional Labels?NextNext post:Is Natural Sugar Good Or Bad For Children?